Local Union 11 believes in the recognition of its members, their actions and outstanding efforts in service to our membership and one another. In keeping with this belief, our International office has recognized the heroic efforts and selfless deed of Compliance Officer Eric Brown, who has been a career member for more than some 35 years. 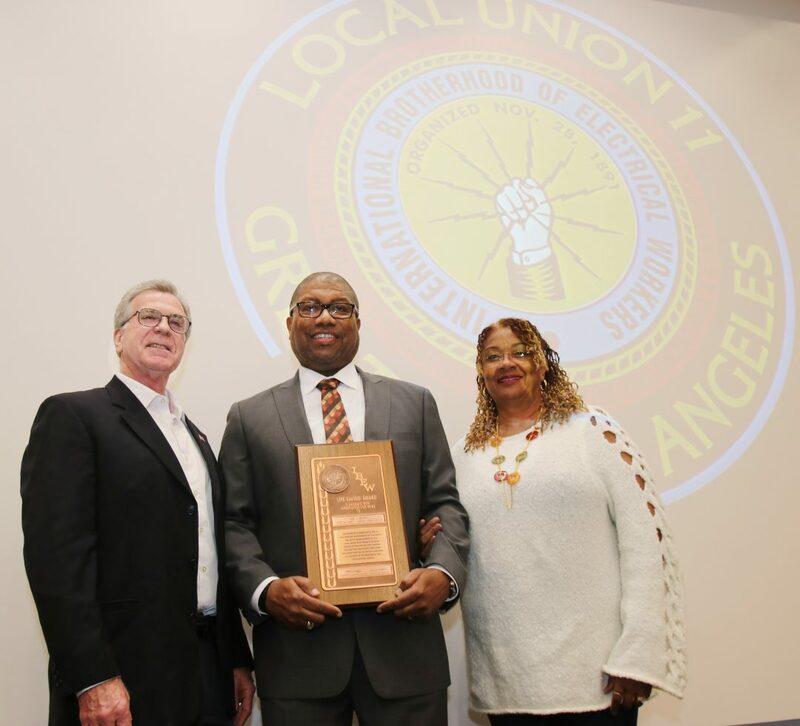 During IBEW 11’s March 2019 General Meeting, Brown was presented by our Local 11 Business Manager Joel Barton with the International Brotherhood of Electrical Workers “Life Saving Award,” which is the highest honor we can bestow upon a member, as quoted by our International President Lonnie Stephenson. In May of 2018, while working in the capacity of Apprenticeship Coordinator, Brown – without thought or hesitation – rendered an immediate life-saving response to a member of our clerical staff who was choking. His repetitious CPR and first aid training over the years immediately took over, allowing him to respond calmly and accurately to the situation, therefore resolving the problem by restoring the victim’s breathing by clearing the airway of the obstruction. Had it not been for Brown’s responsiveness and quick thinking, the incident could have turned tragic. When asked how he felt about the incident, Brown merely stated that he didn’t feel any recognition was warranted as this was merely his professional responsibility to render aid to anyone requiring assistance. He did cite his Naval training as well as his Local 11 training to allow him to act confidently.